After each Patriots game, I'll be taking a look back at the game film via the NFL Game Rewind and posting my X's and O's observations. 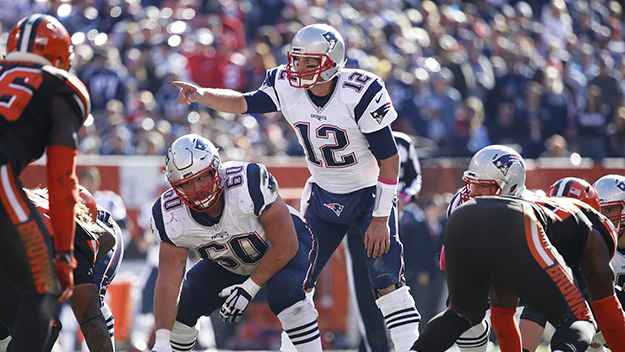 Without further ado, here are my takeaways from Tom Brady's triumphant return to the field. No one could be surprised by the result of Sunday's game. In fact, it would have been shocking if the Patriots didn't roll in the first game of Tom Brady's revenge tour, regardless of the opponent. However, sending the winless Cleveland Browns out there as the first team to face Brady felt cruel long before the game kicked off. The Patriots were supposed to romp in this one, and they did their job en route to a 33-13 blowout win that wasn't as close as the scoreboard indicated. While the real tests will be coming in the following weeks, it was encouraging to see how the Patriots offense moved the ball at will against Cleveland, as it was essentially the regular season debut of what figures to be the Pats offense going forward. The offseason acquisition of tight end Martellus Bennett created what figured to be an unstoppable duo at the position, as Bennett and Rob Gronkowski are two of the few remaining tight ends in the league who create mismatches in the passing game while also excelling as blockers. Gronk's versatility was already a key to the Patriots offense, which has excelled for years in the between the snap chess match of creating scheme mismatches, and with Bennett now on board, the X's and O's possibilities seemed endless. 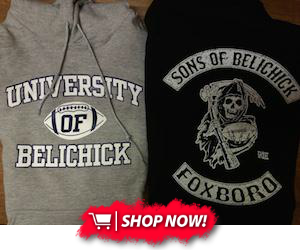 Despite the offseason hype, Pats fans had yet to see the Gronk/Bennett duo unleashed. An August hamstring injury left Gronk sidelined during the season's first two games. Gronk made his 2016 debut in Week 3, but spent his first two games working his way up to full speed. With third string rookie Jacoby Brissett under center, the Pats ditched their normal offense for a misdirection-based, option-heavy running attack, further limiting the opportunities for Gronk to get going as a pass catcher. That was no longer the case on Sunday. With Tom Brady back, the team reverted back to their full offensive playbook. Combine that with Gronk being a week healthier, and the ingredients were finally all there for the offense to operate as designed. The results were obvious, as the Pats moved the ball at will against the Browns before letting off the gas a little bit in the second half. The multiplicity of the Pats personnel was evident from the start of the game. One telling example came here, on the Patriots second possession. 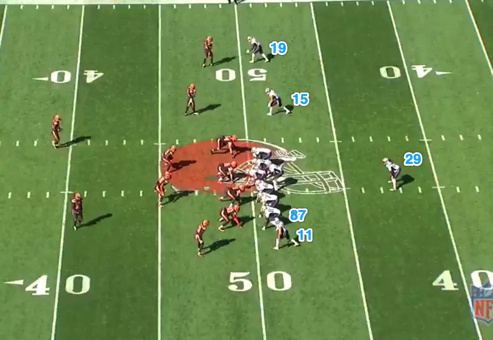 The Patriots opened the possession with "12" personnel (1 running back, 2 tight end), traditionally running personnel. However, with James White as the back and Gronk and Bennett as the tight ends, the Pats are equally capable of passing effectively with that personnel. 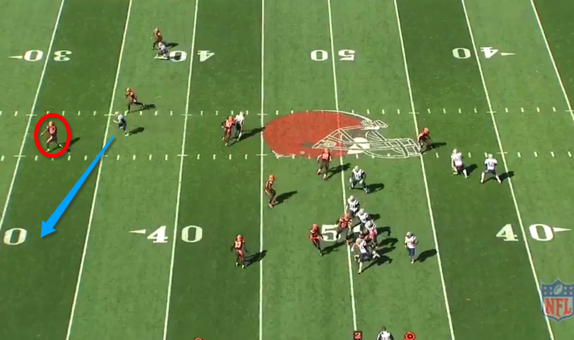 Honoring the threat of the run, the Browns match up with their base defense, keeping three linebackers on the field. 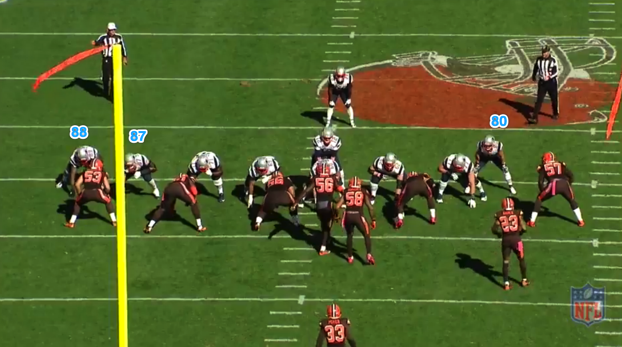 The Pats respond to the Browns leaving their base defense in by spreading the Browns out. As you can see, the Pats have created mismatches all over the field simply by their alignment. White motions out to split to the far left sideline, with Chris Hogan in the left slot. Cornerback Jamar Taylor stays split out to his side, indicating that zone coverage is coming (if the Browns were matching up in man, they surely would have a linebacker follow White's motion). 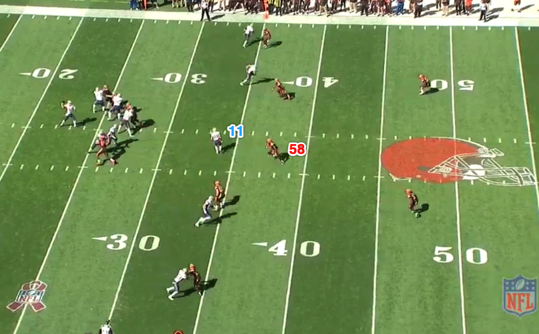 Meanwhile, Bennett is split out on the right side, drawing star cornerback Joe Haden. 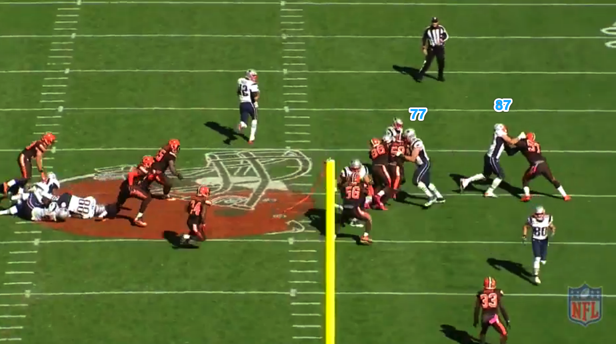 That leaves Julian Edelman and Gronk, both lined up on the inside, with linebackers lined up over them. Take a look at what happens after the snap. 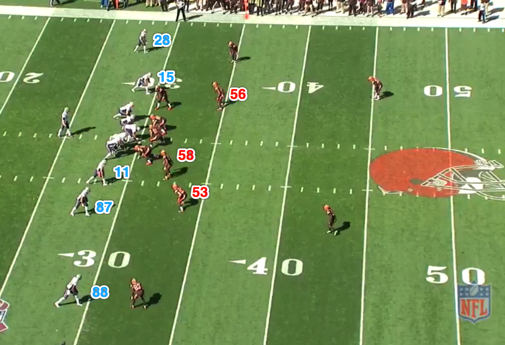 The Browns appear to be running a basic cover 2 zone, with the safeties splitting deep halves of the field and the middle linebacker, Christian Kirksey (#58) responsible for dropping deep as essentially a third safety. However, the defense is supremely compromised at the snap due to the Patriots alignment, as both deep safeties must account for Gronk and Hogan, both of whom are pushing their routes up the field against mismatched linebackers Joe Schobert (53) and DeMario Davis (56). Meanwhile, Kirksey's deep drop creates way too much space in the middle of the field, which Edelman quickly takes advantage of on a quick slant. Brady gets it to Edelman quickly, giving the Patriots most elusive open field runner the ball in space against linebackers. The result is a nine yard gain and an easy first down. The Patriots next drive saw a 43 yard pass to Hogan set up yet another touchdown. Once again, the Pats pre-snap chess game created an advantageous situation for the offense. This time the Patriots have gone with three receivers and just one tight end. However, they are lined up in a running formation, with Gronk in-line and Edelman lined up near the line of scrimmage, where he'd been utilized as a blocker plenty during the Patriots run-heavy game plans over the season's first four weeks. LeGarrette Blount is also lined up in the backfield, giving the Browns a run tell, as he's used predominately on running plays. The Browns match up with their nickel defense, and the Patriots hit them with a heavy play action fake. The entire line fires out as if running a zone stretch left, a play that has been a staple of Blount's productive start to the season. As you can see, nearly every member of the Browns front six gets sucked into the play-fake (left defensive end Carl Nassib wisely stays home, but is held off by David Andrews, who peels back after firing out with the rest of the line to take care of any backside pressure). 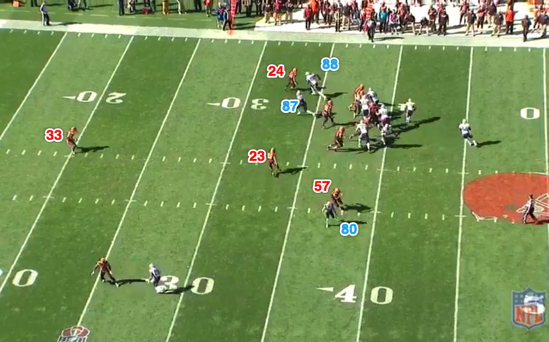 This gives Brady plenty of time to wait for Hogan's deep route to develop. ...but that leaves him in poor position to defend against Hogan's in-cut. Hogan's deep post forces him to flip his hips for the third time of the drop back, giving Hogan all the space he needs to get open. Brady, of course, leads him with a perfect pass, placing the ball where only Hogan can get it. The result is a highlight reel worthy 43 yard gain. Bennett's third touchdown of the day was another example of how combining multiple personnel with run formations and play action could create big plays for the offense. Here we see the Patriots once again using "12" personnel, this time with both Bennett and Gronk lined up in line on the right side of the formation. James White is in the backfield, Danny Amendola is lined up just off the line and Malcolm Mitchell (not pictured) is split out left. The Browns match up with their base defense, keeping their corners lined up across from the Patriots two receivers (#23 Joe Haden is visible across from Amendola). The Pats hit the Browns with yet another play fake, this time with the offensive line firing out to simulate a zone stretch right. 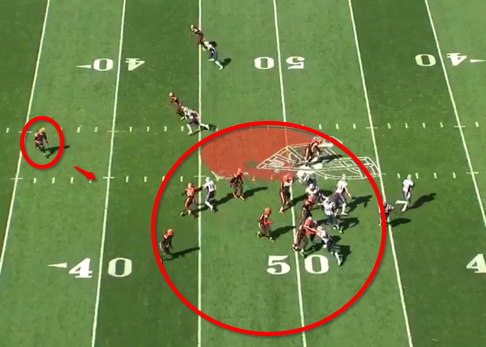 Gronk helps to sell the play fake by blocking linebacker Joe Schobert briefly before releasing into his route. However chaos ensues once Brady pulls the ball out of White's belly and begins to survey the field. For some reason, 268 pound linebacker Cam Johnson (#57) is covering Danny Amendola, rather than Pro Bowl corner Joe Haden, who is covering...no one in particular. Meanwhile, Gronk is mysteriously left uncovered on the right side of the field. Brady actually passes up a wide open Gronk for an even more open Bennett, who dusts by strong safety Ibraheim Campbell (#24) after Campbell bites hard on the play fake. The Browns ineptitude makes the play easier than it should be, but this is yet another example of how difficult the Patriots are to defend when both star tight ends are in the line up together. That multiplicity didn't show up in the running game as much. Cleveland, apparently unaware that the play-calling might change a bit with #12 under center, seemed determined to stop the run, often leaving their base defense in when most teams would likely go nickel. As a result, they held the Patriots to just 98 rushing yards on 35 attempts, good for a paltry 2.8 yards per carry. Those numbers were skewed a little bit by plenty of predictable late game, clock-killing handoffs, but the Browns did do a good job overall against the running game. However, the Pats turned their aggression against them with great success when they ran play action and picked them apart in general in the passing game, partly due to the Browns sticking with their base defense and the bad coverage matchups that ensued. However, plays like this one, from opening drive of the second half, showed how the Patriots tight end duo can open up the running game as well. The Patriots opened up their first possession of the third quarter with six consecutive passes, must of them coming with both tight ends on the field. On the seventh play of the drive, they lined up in a running formation, with Bennett in-line right and Gronk in-line left, and ran a successful outside run. As you can see, Gronk easily holds off strong side linebacker Cam Johnson, while Nate Solder utilizes his athleticism to get in position to wall off hard charging linebacker Christian Kirksey from the hole. The result is one of the biggest holes a running back will see, as James White manages a quick eight yards on first down. White had by far his most productive game of the season on the ground, turning his five carries into 26 yards, and the stress New England's multiple personnel put on the Browns certainly helped create space for him to run with. With a full game of Brady's passing game dominance on film, the Bengals will likely run far more nickel packages than the Browns did this coming week. That could lead to more success on the ground, as the Patriots two tight ends are certainly capable of handling their end of the bargain at the point of attack. The Bengals appear vulnerable on the ground, as they've allowed 4.4 yards per carry for the season and were absolutely gashed by Ezekiel Elliot and the Cowboys last week. They'll face the near impossible challenge of trying to match up with the Patriots passing game weapons while simultaneously not leaving themselves extremely vulnerable against the Patriots running game. It's a challenge that the rest of the league now faces, as the scheme flexibility their personnel affords them makes them the toughest team in the league to match up with, let alone physically line up against and play.